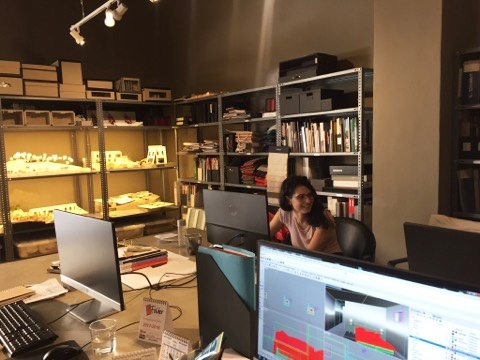 I am going on telling you about my experience in the OHLAB architectural firm, based in Palma de Mallorca. During these weeks I had been working specifically on drawing plans, sections and fronts of a project staying at this time in the preliminary phase, still pending for the municipality permission. This is a new block of apartments to be built in the central area of the town. The project is very interesting and challenging for me, because I had to deal for the first time with regulations and constructions issues, and then I could understand which documents and drawings the studio has to submit so that the project can be approved and how to achieve them. In addition I began making the difference between Italy and Spain as regard the process of a building phase, who is involved, how long each phase takes and the legal topics. Another important aspect I am realizing through the task I was assigned in these weeks, as well as by following the general organization of work in the studio, is how much time an architectural firm needs for each project phases and for the other general, marketing and technical stages. I begin improving my capacity of working in team, since I have to work together with a colleague, sharing files, ideas and working method with him. Moreover, in the last three weeks my project manager gave me the chance to participate in a reunion with an employee of a building company, during which I could understand a lot about the specifications and without losing the overall good quality level. not a metropolis in search of fast and uncontrolled urban and architectural development, here I can find a particular attention toward a kind of architecture attentive to living space, landscape, sustainability, precision, details, able to respond to the specific needs of people who should live the space with the aim of making their experience more agreeable. Thanks for your attention. Soon I will give you another update!! !